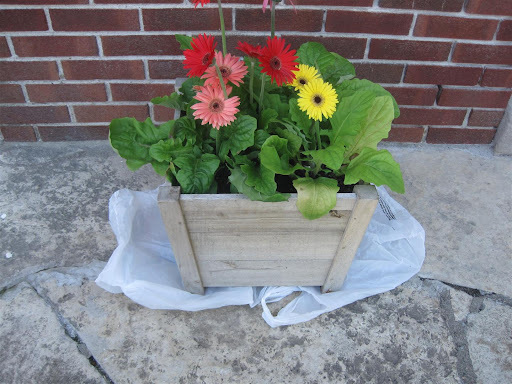 After I spiffed up my bench on the front porch, my planter full of Gerbera daisies was looking SAD. Here is it right after I planted the flowers - which is why there is dirt everywhere. Whipped out the same stain used on the bench, and got to work slapping it on. 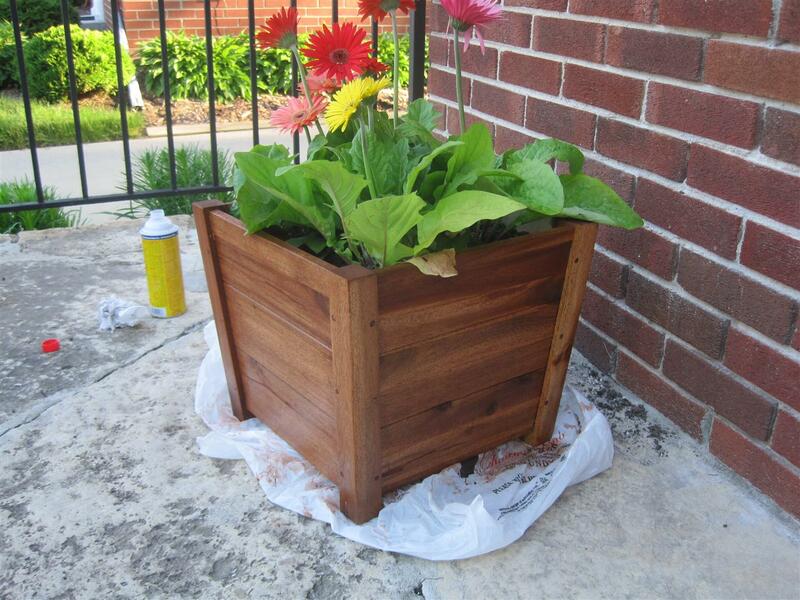 I'm not sure wood stain is good for flowers. Oh well, it was worth it. I know, I'm such a weirdo and did this totally backwards. It turned out great though, and it looks so much better with my bench! Next time I will figure out whether something needs to be painted before I plant things in it. Duh! It looks fabulous Sara... MUCH better than before. And I totally would have done the same thing. Ha! I am the undisputed queen of doing things backwards, though nice try. It looks great stained. All's well that ends well, eh? Wow - it looks so much better!! I love the color of the stain that you chose. Oh it does look nice .... better backwards than not at all! 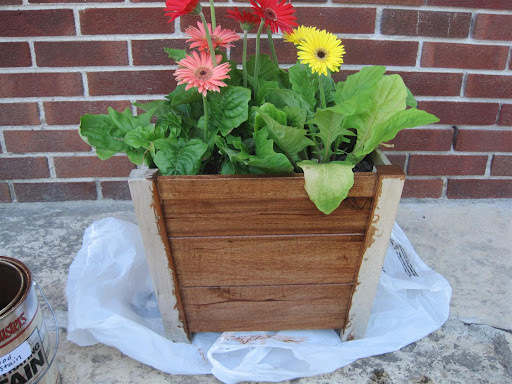 Anything that honours the beautiful gerbera is a wonderful thing. So worth the effort. Confession: I didn't know there were Piggly Wiggly stores anymore--my only reference is from "Driving Miss Daisy", and I live in Canada, so what do I know? I also like the carefully placed brewski on the little side table. Nice to sit and admire all your hard work with a cold one in your hand. I'm glad I'm not the only backwards project-doer. And I wish my gerberas looked as nice as yours do; two weeks after I planted mine on the back deck they're already heading for the great beyond. Apparently my excuse for a green thumb does not extend to daisies! 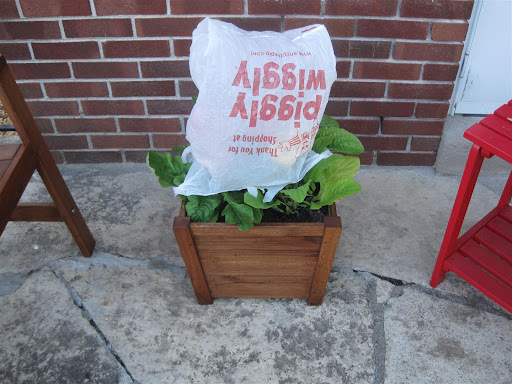 The bag over the plant pic is hilarious. It turned out great though, even if you did do it a little backwards. The point is that it worked and it looks great! Sounds like something I would do ;) Looks great! 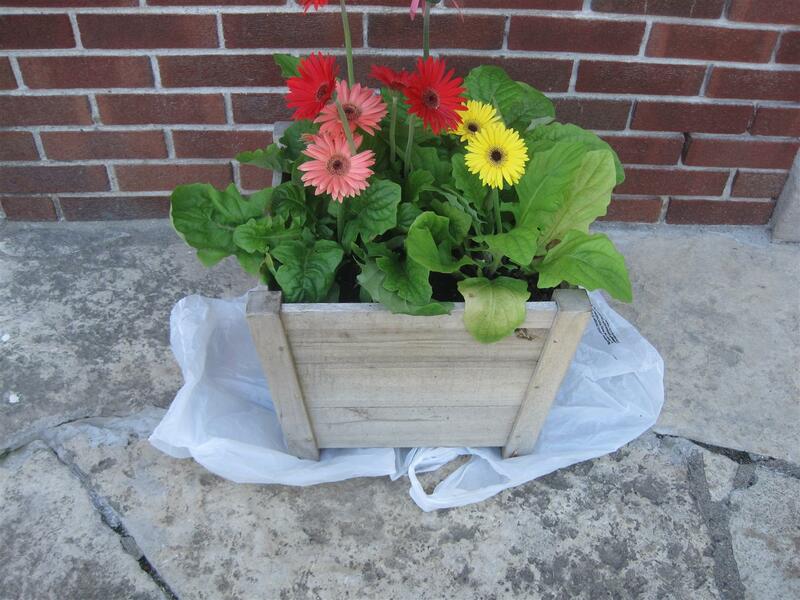 ok, i had to laugh out loud at the poor flowers with that plastic bag over their head. that is too funny. the after looks really good, tho! You are seriously a staining machine... and I like it! Haha! I'm right there with you. The planted that I painted blue is chipping, so I'm going to touch it up...and I'm not going to haul the plant out if it first. Rebels, we are! I'm glad to see that no plants were harmed. I love those daisies. The new color is so much better. Looks great. BTW, I had a great idea for your Blog. You should do "guest spots" where you show up at your friend's houses and makeover one (or several) of their rooms....you may start with mine. It looks fantastic. 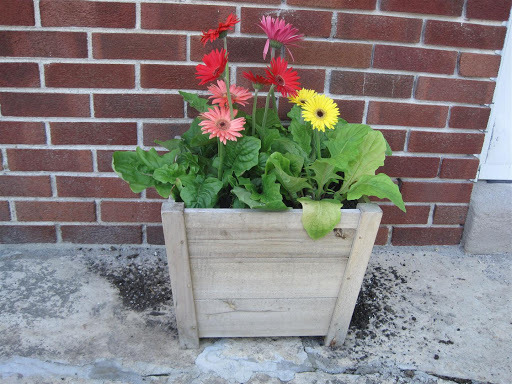 I bet the flowers were happy to keep you company while you worked on the planter. Kudos! Those daisies are so cute. They give your porch a nice pop of color! I've stalked you before! Cool stuff, you are on my list of peeps to hit, believe me. Love the plastic....one of the most versatile DIY accessories! 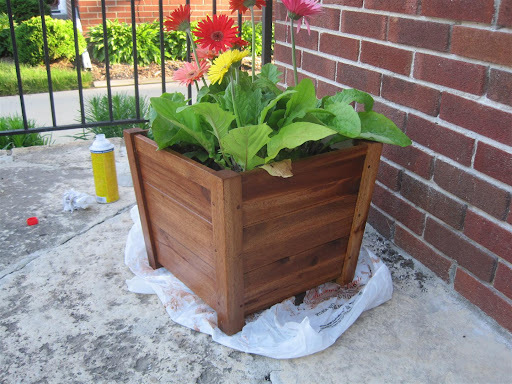 The front porch looks so good and I am sure the plants fine...you do not need to eat them so a little wood stain can't hurt anything!